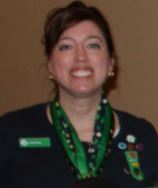 Virtually Badges website evolved from a need at the troop level in Girl Scouts as seen by a volunteer leader. As the girls in the troop were getting older and becoming more involved in other extra-curricular activities, the need for a different approach to keep them involved in this great organization and work around their busy schedules was apparent. The resources created have proved to be useful for the participants to stay active in Girl Scouts and provide easily organized resources for troop leaders to use at face-to-face meetings as well! Deborah Dunn is the volunteer curriculum developer and workshop facilitator for this website. She received a Bachelor's degree in both Biology and Secondary Education, and a Master's degree in Educational Curriculum & Technology. She is currently certified to teach 5th-12 grade life, earth, & space sciences. She has over 12 years of teaching experience. She has taught Biology, Honors Biology, Genetics, Life Science, Anatomy/Physiology, Physical Science, Earth/Space Science, and Spanish. She received the Top 25 Educator Award in her school district. In addition, Deborah has been a scout leader for both her son and daughter for a total of 10 years and counting. Within both national scouting organizations she holds or has held numerous positions including youth Leader, Treasurer, Committee Chair, Assistant Cub Master, Community Troop Organizer, Service Unit Mentor, Council Training Facilitator and writer of training materials for the council level. She received the Spark Plug Award for leadership from her local Boy Scouts of America Council. She maintains training in both national scouting organizations, including training as a Boy Scout Merit Badge Counselor. She is a lifetime member of Girl Scouts of the USA.